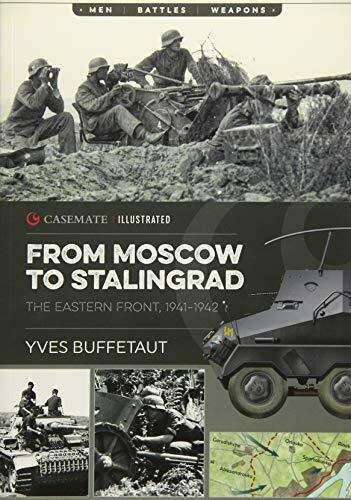 This volume in a new series by Casemate Publishing highlights the Eastern front campaign from the ending of the German 1941 offensive at the gates of Moscow to the German 6th Army fighting in the outskirts of Stalingrad. The spring and summer of 1942 was the last moment the Germans might have achieved victory over the Soviet Union, and while the book attempts to cover a great deal of ground, it does so in a somewhat uneven manner. Operation Blue was the codename for the German summer offensive meant to capture the main Soviet oil fields in the Caucasus region and deprive the Red Army of the oil supply needed for modern warfare. The offensive ranged over thousands of miles of varied geography and nearly succeeded. However, the logistical and manpower shortfalls of the German Army ultimately brought the offensive short of its intended goal and left the German forces severely overextended and dangerously weakened as winter set in. The two significant campaigns covered in this book are the siege and capture of Sevastopol, the prize of the Crimean Peninsula, and the German advance to the outskirts of Grozny. Both battles are captured in some detail and the author does a good job of using eyewitness excerpts to provide additional viewpoints of the brutal combat that summer. The scope and sweep of the German advance into the Caucasus would have been much better depicted with a specific map, which was unfortunately left out of that section. The advance of the German 17th and 1st Panzer Armies were the deepest penetrations into Soviet territory, but as fall started turning into winter, and Adolf Hitler’s attention turned increasingly to the city of Stalingrad, logistics and manpower problems, combined with stiffening Soviet resistance, prevented the Germans from their overall strategic goal. This section of the book does a serviceable job, in spite of the lack of an overarching map, in describing this desperate, nearly successful, but often overlooked portion of the German offensive. The book includes many rarely seen photos from German military archives, as well as several outstanding color plates of the major aircraft and armored vehicles used by both sides, staples of a book in this genre. Some additional vignettes on significant commanders and forces are also well done. Unfortunately, the book doesn’t seem to have a definite ending and happens to just peter out describing the advance of the German 6th Army into Stalingrad, which will clearly be the subject of a different volume; and the author missed an excellent opportunity to describe the bitter fighting that occurred along the Don River during that critical summer as the Red Army was pushed into the suburbs of the city. This fighting delayed the German advance and drew increasing attention from both Hitler and Stalin as the city, of dubious military value, began to take on a symbolic meaning out of proportion to the eventual maelstrom it would become. The wonderful photos and illustrations make this book entertaining, but it misses the potential to fully describe the German 1942 summer offensive in all its significance before Stalingrad became the sole focal point of both dictator’s strategic attention.